It would be the beginning of Rocktober and the night that marked the start of my last month in LA. While I haven’t been here long enough to really get completely comfortable anywhere, I’d have to say metal shows at the Key Club have become the closest thing. It was a Sunday night, and it had been a really hot day, like the summer’s death knell. 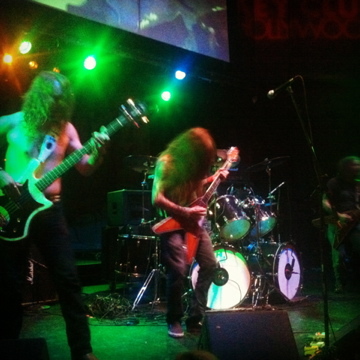 The Key Club was sparsely populated when I walked in at 8pm, but it became incrementally fuller as each band played. 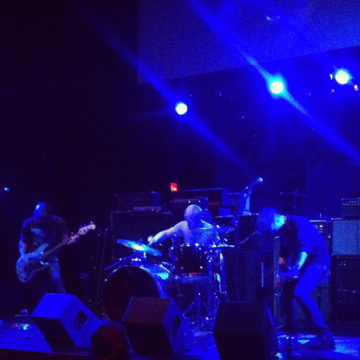 Fight Amp are a three piece from New Jersey, who’s sound triangulates that of Black Tusk, Bison, and Kylesa. It was immediately apparent they were on the tail end of the tour, something that I would be reminded of again and again that night. They looked ragged, but played monstrously…and as other members of the bands would walk by, you could smell them coming….and my nose barely works! It was also that point in the tour where you could tell they had all bonded and formed a brotherhood rife with inside jokes, as some things said on stage were probably only funny to those involved…but what’s better than an inside joke with your comrades, right? The Jersey accent of the bassist sounded more Boston to me, as someone next to me yelled ‘clam chowdahhh!’ as he spoke. P.S. If you’re gonna drink PBR while talking into the mic and need to burp…either exaggerate it comically or move away from it! I’m a huge Bison B.C. (for those of you who don’t know, you just say ‘Bison’, not B.C.) fan now and I was super sad when I learned a couple days before that Dan And, who I’d interviewed a while back, had to drop of the tour for a bit (rumor was he quit…I’m told he will be rejoining for the rest of the tour). They also have a new drummer since I’d last seen them…my friend pointed out he looked like a metal Bozo the Clown…I concur. I was wary of how they would pull this off one man down….but what they lacked in fullness of sound, they made up for in energy. I mean, they were going CRAZY up there…this is perhaps how stress manifests onstage. They made a lot of Canada jokes in between songs…I mean it is pretty crazy that every touring musician’s hurdle is getting into Canada…I mean, really? Come on! Best part of the set was “These are My Dress Clothes” -> “Stressed Elephant”….and then the set ended much too soon. Saviours is the kind of band that I’ve grown to like a lot over time. I’ll admit that a lot of that has to do with the fact that the band reeks of authenticity, and I respect that. In my opinion, they’re the type of band that I like better live than recorded…but I still don’t fully ‘get it’. They have a lot of fans that swear by them, and you can see them roll up to the front as they come on stage, because they sort of emulate ‘the Saviours look’. 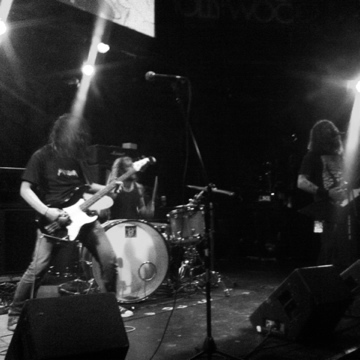 Weedeater: they begin their set swigging a bottle of whiskey and drone sounds to get the crowd amped. There’s nothing like Southern sludge…it just takes you to a certain place in your mind, with a hint of dueling banjos in the background, maybe the smell of fried chicken, or in this case, Grill ‘Em All burgers. As a Southerner, the accents, the sounds, the unrefined caricature that this band is…it hits home for me. But, I have never become a big Weedeater fan because the vocals hurt my ears…it sounds like he needs to clear his throat and this bothers me on some primal level. So, when left with the music to focus in on, I might as well just listen to EyeHateGod. 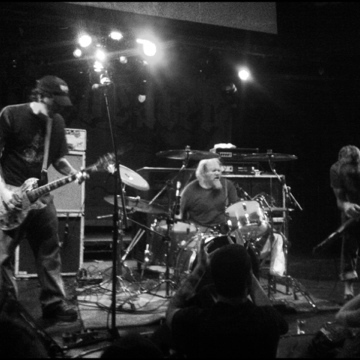 Regardless, Weedeater are a fun live band to watch…they’re fans are something else, too. I would love to see a toxicology test of everyone on this tour…I bet it would provide an phenomenal graphic for a tour poster that I would gladly purchase, to give them more money for drugs & alcohol. I ducked out a tad early, because less than 24 hours later, I’d be right back there again.